Jeremy Bonderman is better than you. Jeremy Bonderman explains why he is better than you. A later pictorial addendum to the post may be found here. Attention Tigers: You are officially allowed to score runs sometimes. An inter-departmental email chain from within the Detroit Tigers organization. Alan Trammell and the Grim. Face to face with a horrific visitation. Bobby Jenks is a cane toad. A scientific comparison. We want Joel Zumaya back. Thus, a poem! With apologies to William Blake. Viva la resistance! Viva la Guitar Hero! Video games are bad for baseball players. Noble poetry for noble cats. Haikus. of arteries and clots. Learn about Kenny Rogers’ thoracic outlet syndrome with words and drawings and educations. today, Chad Durbin is a pimp. The start of a beautiful era. Also worth checking out: Is it goodbye? one last pimp for Chad Durbin, the end of the era. For all the posts about Chad Durbin being a pimp, please see the Chad Durbin is a pimp category. Joel Zumaya vs. tendons: FIGHT! The finger injury explained, with pictures. Justin Verlander: 0-0-0-0-0-0-0-0-0. The no-hitter. Introducing the Spazzosaurus of the Detroit Tigers. A baseball parasite, explained. For all Spazzosaurus posts, please see the Spazzosaurus category. Rollercoaster Jones bounces back. One of the more popular (?) RotT images. The Tale of the Elusive Scoreless First Inning. Poetry vs. Jeremy Bonderman’s first inning struggles. Zumaya’s busted shoulder: explained. It’s 10 pm, do you know where your acromioclavicular joint is? With illustrations. Detroit News writer vs. Tigers bloggers: fight for the ages! Chris McCosky is a jerk and a ween. Jim Leyland puts a letter in a bottle and throws it into the ocean. A poignant cry for help. How to Sweep the Yankees in New York: a guide by the Detroit Tigers. Advice from various players. From the Hastily and Sketchily Drawn Sketchbook: 6 possible reasons the Detroit Tigers are struggling. Apparently people enjoy Terrible Cartoons, who knew? 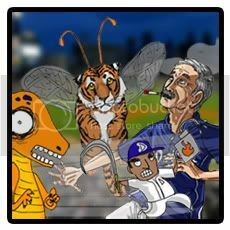 Jim Leyland says many bleep-able things: causes, flip out, and effects. Don’t make him angry. Midseason report card, 2008. What it says on the tin. I HATE NICK SWISHER. An exercise in healthy venting. All the 2009 WBC liveblogs. Collected links from RotT and BCRS. The Curious Case of the Missing Tiger Bats. A mystery indeed! A Detroit Tigers Passover, 2010. The best seder plate in MLB. The greatest baseball movie of all time (and you’ve probably never seen it). THE CAT OWNS A BASEBALL TEAM. Everything that happened in 2010 crammed into one Terrible Cartoon. Everything that I could remember, anyways. Where in Florence is Ugueth Urbina? Where in Seattle is Ugueth Urbina?